This is the seventh in a series of posts about Apps for Amsterdam: Open for Business, an initiative by Appsterdam, Amsterdam Economic Board and Waag Society to work with three local start-ups to support them in making successful businesses using open data. I’m participating with Bike Like a Local. On April 9, all Open for Business teams were invited to Pitch Club. This is an open monthly event where people can practice their 60-second pitch. They then receive feedback from Mike Lee. I consider myself a decent pitcher, and was one of the winners of the Amsterdam Startup Week / Appsterdam pitch contest, pitching about Openbaar Vervoer. However, there is always room for improvement. And of all my apps, Openbaar Vervoer is probably one of the easiest to pitch, because so many people immediately understand this need. I was quite happy with my pitch. The challenge Mike gave me was to make it apply more to the audience of the evening, as it was aimed mostly at potential users of Bike Like a Local. This is not simple, but a valid point and definitely achievable. The evening was also a nice opportunity to meet new people. I did a redesign of much of the user interface of Bike Like a Local, to make it look more polished and professional. 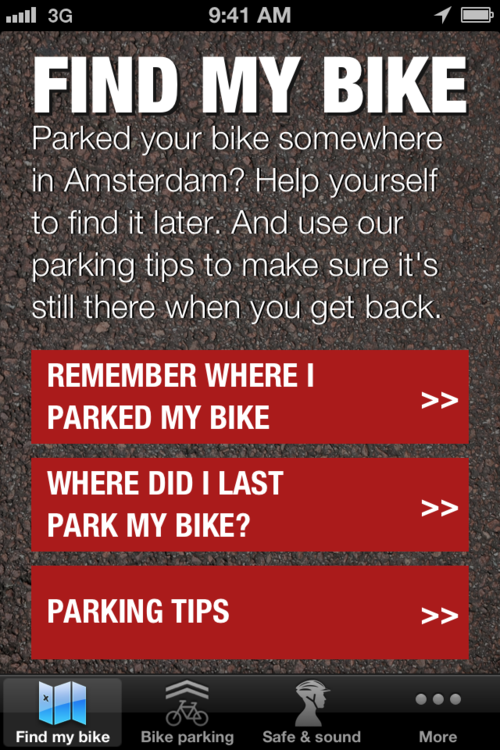 I added over 10.000 bike parking spaces provided by Stadsdeel Nieuw-West. I also added a database of contact information and improved some of the tips. I realised I could just release all these updates already, so a new version with these changes is now waiting for Apple review. Release expected about a week from now. Amsterdam Like a Local has been rejected twice by Apple. I’ve made corrections, and the latest update is now in review. The Dutch Ministry of Infrastructure and the Environment sent me a large set of reports about the safety of using music and phones while on a bike. I still have to read it all, I plan to use this to make sure I don’t actually make it less safe for tourists. I approached many bike rental agencies with some questions about how they handle certain situations, and got a lot of other useful feedback from them as well. Once I have all the replies, I’ll aggregate all their input. I sent a WOB-verzoek to Stadsdeel Noord and Stadsdeel Zuid-Oost to provide me with the zones where they do strict parking enforcement for bikes, if any, and their bike parking locations. They have ignored previous requests; a WOB-verzoek means they have to reply or eventually pay a penalty. I asked ATCB whether they have any data on internet connectivity for tourists. Do they use roaming? Do they not use internet at all? Do they buy a temporary Dutch SIM?